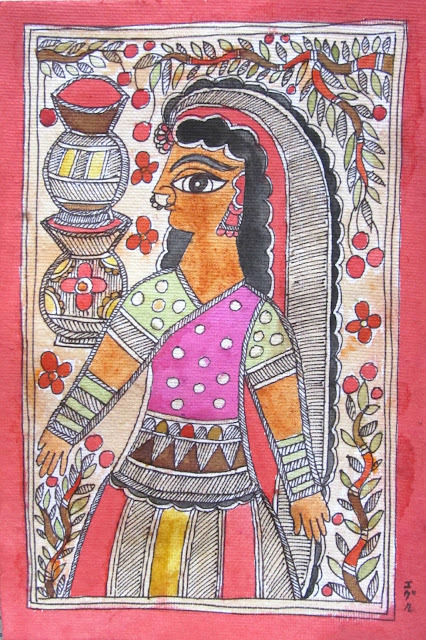 As everybody already knows, original Madhubani is painted using natural colors. Natural colors are those extracted naturally from plants, stones, vegetables and other things found naturally in nature. Poster, acrylic, oil colors and colored ink all can be used to make a Madhubani. Even plaster of Paris can be used to make a Madhubani artwork. Original Madhubani works are made using natural colors on handmade paper that has been treated with cow dung. That is the real village style Madhubani that dwells of authenticity and is the expression of the unusual, symbolic, tantric folk tradition. Poster colors, as well as acrylics do not "feel" natural themselves. 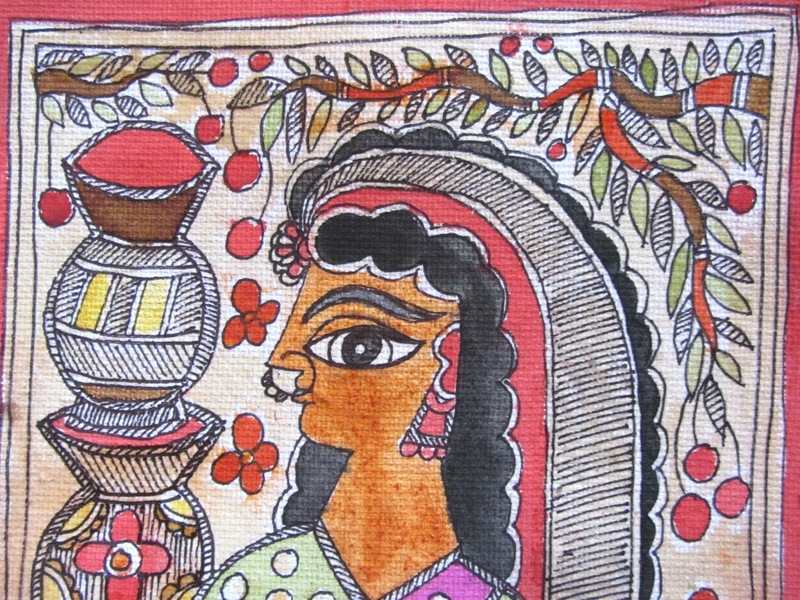 Natural colors are not bright, they are more like water colors when on paper and that watery consistency and earthly origin is something that adds authenticity to a Madhubani painting for those who are looking for it. 1. It is extremely cheap. 2. It is fun and adventurous. 3. You search, experiment and create the shade you want. 4. It's nature friendly - no plastic bags, bottles, tubes and chemicals used. 5. It is as handmade as the paper you're using. 6. It's not thick at all, so it makes filling in colors a lot easier and faster. 7. When filling in color, the black line will be see through, so you don't need to over-line it later. 8. When painted, it looks as original and village like as the Delhi Hath Madhubani painting. 1. The palette may be not as impressive. 2. The colors might not be as bright as non-natural ones. 3. Most of them might need to be thrown out after 1-2 days cause they expire as fast as food. 4. You need to make them yourself. 5 With the color range being smaller, you might want to perfect your line work and the story so that the color is not the only thing you have to impress the viewer. 6. It's hard to make blue color. Mix turmeric powder with hot water and let it cool. The paste should be not too thick, but not too watery. Try making a similar paste into that of a liquid acrylic paint meant for fabric. 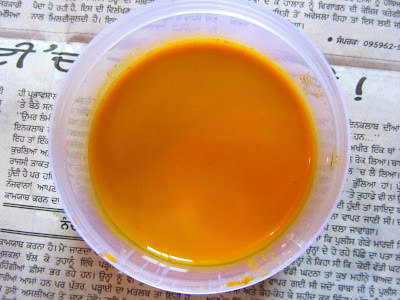 Later the turmeric power will become separate from water but I suggest not to use the sieve and just mix it once more before using the paint. All the extra turmeric powder pieces will naturally fall off when the painting is dry. To get a terracotta color I used Kashmiri chilli powder mixed with hot water. I am not sure if Kashmiri chilli powder is the same thing as red chilli powder but I know that it's famous for its color rather than spiciness. Mix it to a similar consistency like the acrylic paint for fabric that is found in small bottles. I guess that dark brown is easiest to make by using 2 tbs of black coffee and some hot water enough to make a paste. It melts perfectly without leaving extra pieces of powder. Making yourself a cup of hot water with 3-4 teabags will leave you with a unique golden light brown color. It came out pretty watery for me but I liked to use it for the background as my paper was white. It gives that rusted old book feel. To make green it's a good idea to use any green leaves such as spinach or fenugreek. Blend some leaves with few spoons of water until the leaves turn into something close to a paste. If you don't have a blender, you can use a mortar (okhli). Sieve the leaves and throw them out. The water would have turned green - you can use it as green paint. If you don't have the leaves, you could also use green tea leaves. Just boil some water with loads of green tea leaves and let it cool. Use the water as your paint. I got some different shade of brown when mixed hot water with some henna powder. I expected it to turn out green but it turned out brown. My mother-in-law had some salty drink made out of beetroot juice in her fridge (jal jeera). The bottle was leaking and making big magenta spots all over the fridge. I took some upstairs and used it as a pink paint. It had a nice shade in the beginning but later it almost disappeared leaving just a slight pink shade. I am sure that if it was not diluted with so much water, the fresh beetroot juice would be an amazing magenta/pink. After I got my terracotta shade from the Kashmiri chilli powder, I really didn't want to spend time making carrot juice. In any case, I think, carrot juice would have been a purer orange. Another way to make orange would be grinding marigold flowers with some water. This way might be a little expensive if you don't own a marigold plantation. I tried many things but I couldn't extract a perfect crimson red. Red is the most used color in Madhubani paintings and it's important to have a good source of red. You can call it a cheating but I made my red mixing sandoor or kumkum powder with water but unfortunately it turned out to be reddish maroon color. I wanted the bright scarlet effect more and just poured some red Holi/Rangoli color in it (powder color used to play Holi and make Rangoli designs in India, also used by some Madhubani artists). The color was perfect at the time of painting but when dried, it turned pink! Surprise! To get orange red I used food color powder that my mother-in-law uses when cooking colored rice. It was indeed an effective color source and it diluted very nicely not separating powder from water. I guess that food coloring can be a good way to get a natural paint although it's not as direct as say leaves. I got grey when mixing coal with water. I was expecting black but it didn't give the brightness and darkness of black. However I think it made a good grey. Krishna and other "blue deities" in Madhubani are often painted in grey rather than blue. Black is the base and outline color in Madhubani. The quality of black should be perfect. In many cases, I think that black Indian ink can do the trick however the ink should be waterproof. 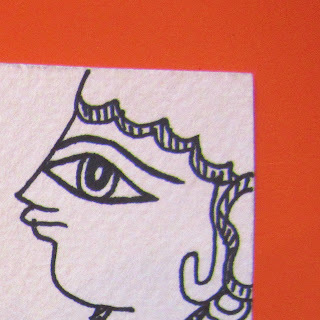 I asked a Madhubani artist how he made black color. He said he covered a burning diya (clay candle with oil and cotton) with the clay bowl (maybe with another empty diya). When it turned black, he mixed that with oil and it became his black color. I know Indian people used to use this way to get their kajal (eyeliner) when there were no eyeliners, and although I haven't tried this way yet, I'm sure it works and when it does, I'll update this post. Another way to get black is to use the black powder that is in batteries. Our maid told me about this. She said they were so poor they used to "play Holi" using this black battery powder. This is, of course, not very natural but it's still something that can be done at home. If you'd like to share your ways of making natural colors, please comment! I'd love to hear other/proper ways of making them. Hi, thanks for your comment! I will start uploading videos..
1. Light red/ Reddish orange: I use powdered 'tesu' flowers( also called 'palash', Butea Monosperma). These were traditionally used for making Holi colours. 2. 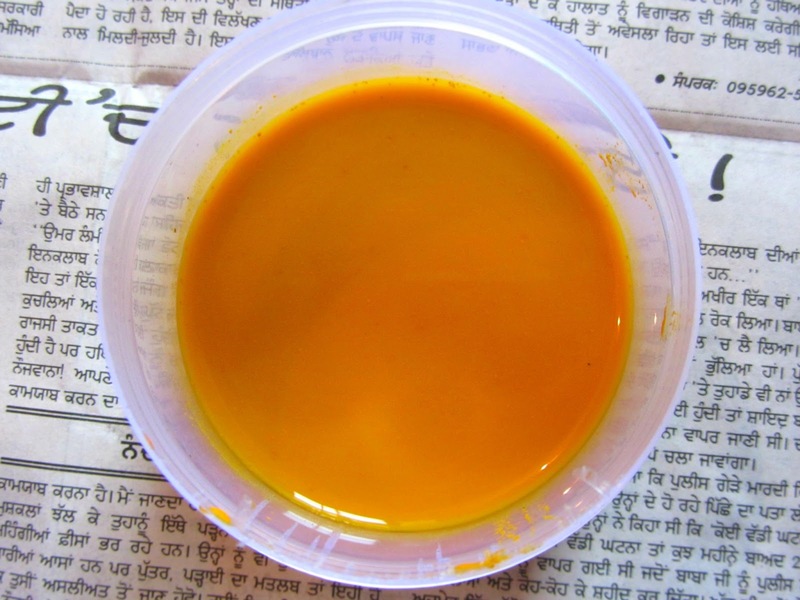 Bright Yellow: A mixture called 'ashtagandh' is used in some Hindu ceremonies. It is made up of eight aromatic ingredients. I came across a particular formula which used a Himalayan herb that yielded a very bright yellow. I was told that the herb was also used to dye woolens. The mixture needs to be soaked and passed through a sieve to get the best results.You can get pure ashtagandh from Uttarakhand/Himachal Pradesh. There are cheaper, bright-orange alternatives available in the market. Do not use those. 3. Deep brown/ brownish orange: a very traditional pigment called 'geru' ( ocher) was used to prepare surfaces on which designs were drawn with chalk and rice flour. Depending on its source, geru may have different shades- ranging from a very deep brown to brownish orange. You may buy 'geru' from a kirana store. 4. Various shades of blue and purple: I use crushed Himalayan bilberries ( called 'kingora' in Uttarakhand). Whenever using a fruit/vegetable-based pigment, I add powdered alum so as to render the final product resistant to fungus and insects. I have heard that locals use parts of the bilberry plant to produce a bright yellow dye, but I have no idea how it is done. Apart from these, Khadi Gram Udyog Stores sell a decent variety of 'certified' natural colors around Holi. I bought a packet of stuff that yields an amazingly bright pink. I love your blog..it is amazingly helpful. I am a mosaic artist, but am also interested in Madhubani art and want to give it a try. I would keep this as my home decor and so need some paint/paper medium that would not faint out with time. What is the best paint for this purpose - poster or acrylic color? Also, is handmade paper good for a long period of time? Thanks for your nice comment and I'm glad you find this blog helpful. About the home decor. I think that if you choose to frame your Madhubani painting, the glass will protect it from going bad with time. Make sure also to hang the painting on the wall that doesn't tend to get wet from the other side or that doesn't have fungus. The dampness on the wall (such as bathroom could be on the other side or the neighboring house could be under construction or it might be the outside wall that goes damp during monsoon) makes the paper within the frame to bend and roll, so this definitely affect the longevity of the painting. I choose fabric/acrylic paint (the brand above in the picture) over the poster colors because poster colors do not have the same amount of thickness and shine. You can straight away tell if the painting was made by the poster colors or acrylic colors. Oil paint also looks good and rich. However it takes time to dry and it's hard to paint the outlines. Although Madhubani artists do use oil paint to make Madhubani works, for me it seemed very timed consuming. Acrylic/fabric paint doesn't require you to use any water, so the thin handmade paper gets covered with a thick layer of paint that hardens the work itself. Acrylic paint also has a unique shine or quality that poster/gouache color doesn't have. I've tried them both and I think acrylic is easier to work with and looks better too. Thanks for all your suggestions and keep up your good work. It's a treat to our eyes. Oh, one more thing: for the blue color, just wonder if you could use the blue/natural indigo that is sometimes used for clothes ?? Thank you so much for this amazing post. :) But I would like to know..Do you apply something(on the painting)to preserve the natural colors..because even if you frame the painting, they can be manhandled while framing..Do these colors remain in their place after drying them? Anonymous, yes, the colors remain on the paper and no, I never apply anything on top of it. As I write now, more than 1 year has past since I made this painting of a Woman and the colors are as bright as before. Boil Amla juice in an iron vessel till its of paint consistency for a rich deep black colour. If you don't have an iron vessel you can simply add some rusted pieces of iron while boiling.